Czech president Milos Zeman will be at the European Parliament building in Strasbourg on 26 February 2014, to lobby for inclusion of the Danube-Oder-Elbe water corridors in Europe’s ‘core corridor network’ for transport infrastructure investments. Ostrava-based MEP Vojtech Mynar has invited interested parties to a round table with experts on the Danube-Oder-Elbe Water Corridor in the ‘Swan Bar’ gallery of the European Parliament building at 16:00. The meeting is aimed mainly at MEPs from the Czech Republic, Poland and Slovakia. A parallel exhibition on the 100-year-old project will be on display at the venue throughout the week. 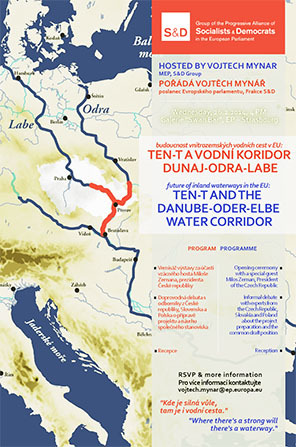 The Czech organisers, who have already established close collaboration with Poland for the Oder branch, observe that the newly adopted priorities of the Trans-European Transport Networks (TEN-T) do not include the international project for the Danube-Oder-Elbe Waterways (called ‘water corridors’ to highlight the non-navigation functions of water management), despite the significant contribution these waterways could make to meeting the EU’s objectives in reduction of road transport, emissions and job creation. To take this project into consideration, the European Commission has already advised the Czech Government that it needs to have a relevant feasibility study and statements of the Member States concerned. The aim of this event is to discuss preparation of the project with politicians and experts, and to conclude with a common statement. NOTE to editors: IWI has already supported the D-O-E water corridor project by writing to the then President Jan Fischer on 14/07/10, as well as to key ministers, before a critical vote in the parliament. If the motion had been carried, the land reserved for these waterways could have been sold off, making it virtually impossible to build the links at any future date. N.B. Entry to the European Parliament building in Strasbourg for this event is restricted to invitees.